A message for you in preparation for tackling Aeschylus at his most baffling. 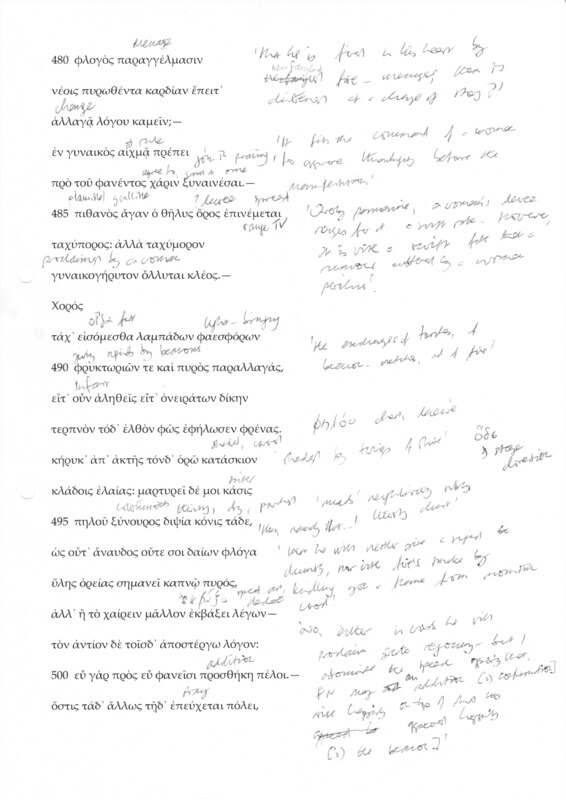 I’d forgotten how tough the Greek is in Agamemnon, especially the parodos and choruses. I must have read the play a dozen times, but I’m still finding it hard here and there to puzzle out the language, much to my annoyance. It’s not helped by the text being dodgy in places. We were in fact due to go as far as line 809 this time, with the remainder to come in November. The six brave souls assembled were keen to tackle every last knotty problem in the Greek text, though some may have suffered more than others in the attempt. As I explained to more than one person over dinner, the format was to go round the group in order with each student reading aloud then translating, and the tutor helping and commenting. We did in fact manage the to achieve the scheduled 809 lines by means of a spirited joint attack on the chorus at the end. I think this was about the most rewarding Greek reading group I’ve been to, probably due to having a small group and a text that forced itself in people’s attention, as well as a very inspiring tutor. The other candidate would be doing Aristotle with the great and good Barbara Goward, where once again the text made claims that a rather small group could not dismiss as that’s all very lovely. We had a talk from Malcolm Schofield, Emeritus Professor of Ancient Philosophy at Cambridge, and he also called the Agamemnon the most formidable text in surviving Greek literature. Apart from that, he was talking about love and the Symposium, where Aristophanes had defined love as the desire for wholeness, Agathon as the desire for beauty, and Diotima as the desire for immortal goodness. After that, Alcibiades had rather muddied the waters. One was not meant to understand the character of Socrates, and there was a lot about him that was unappealing. We also had a meeting to discuss future texts for the Advanced groups, and I discovered (what I had not noticed) a set pattern: Homer for both groups in February, a shorter text for both the poetry and prose groups in May, and one longer piece of poetry/prose occupying both September and November. In giving general suggestions for courses on my feedback form, I suggested that on the one hand Madingley could do life skills courses aimed at their specific demographic (to be based on research evidence of course): Preparing for retirement, Managing your investments, while on the other hand recidivist readers of classical texts might benefit from some systematic instruction in linguistics, a course in Proto-Indo-European/historical linguistics, a course on the Ancient Economy (especially demography). You can see the Madingley course listing here. Do feel free to write to me if you have a query about all this I might be able to help with! This entry was posted on September 16, 2014 at 12:23 am and is filed under Languages. You can follow any responses to this entry through the RSS 2.0 feed. You can leave a response, or trackback from your own site.